At the age of nearly 66 years Mick decided that he was going to walk from Land’s End back home to Ramsgate. On the 24th June 2014 Mick took on his route include crossing Dartmoor, the South West Coastal Path, The East Devon Way, The South Downs Way, and part of The North Downs Way – a little over 400 miles in all. 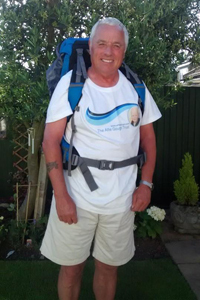 Although Mick could’nt complete his walk with just a few days to go, his determination was amazing but having some problems with His foot he just could’nt carry on. Mick still managed to raise an amazing amount for the charity and truly made a difference. The Alfie Gough trust would like to thank Mick for his continued support.